A security deposit equal to the first nights stay to be pre-authorised on arrival (this is in addition to the cost of the room). This is refunded in full on check-out once rooms have been inspected. You can relax and meet other guests in the common area. The shared kitchen is fully equipped and we have a nice garden out the back. Free Wi-Fi, private car parking for guests and indoor secure storage for bicycles. Laundry facilities and towels provided for a fee. The Quad room has 2 sets of bunks. We have 2 5/6 bed rooms. One has 3 sets of bunks and a single bed, the other has a double bed, 2 single beds and a set of bunks. Triple rooms are double & a single or 3 single beds or a bunk and a single bed. N.b. please confirm which room type you would prefer on booking (subject to availability). We cannot guarantee your preferred room type on arrival without a preference being selected. Cancellation policy: cancellations in the final 7 days will result in the first nights stay being charged. Management reserve the right to preauthorize your credit card for the balance equivalent to amount the first night of your stay. ID is required from all guests. Acceptable ID is a driver's licence, passport or national identity card. We can't accept Garda ID, Public Services cards or any other forms of identification. 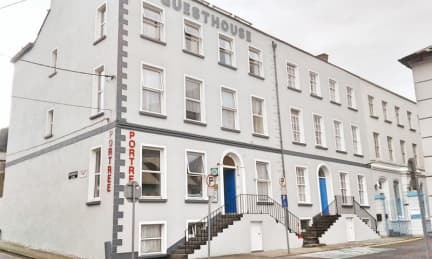 Guests agree to cover the cost of any damage or loss incurred by Portree Hostel as a result of the actions of the guest or members of the guest's group. Check in from 14:00 to 21:00. If you think you will be unable to make it by 9pm please contact us prior to booking to confirm we will be able to check you in as we ordinarily close reception at 9pm. Basic Breakfast is included for free (toast / cereals / tea & coffee). A full continental or cooked breakfast is available for Eur 6.50 or Eur 9 respectively. Ottimo, pulito accogliente, personale.disponibile, una bella atmosfera.